The ETH32 is a general purpose I/O device which communicates using TCP/IP over an ethernet network. This device is ideally suited for remote data acquisition or device control; all that is needed is a connection to an ethernet network. The ETH32 supports up to five simultaneous TCP/IP connections, allowing multiple computers to communicate with the ETH32 device at one time. The ethernet connectivity and TCP/IP communication provide a great deal of flexibility, allowing the ETH32 to be located a long distance away from the PC if so desired. 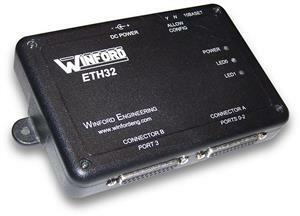 The ETH32 includes a variety of useful features for data acquisition, monitoring, and control purposes. In addition to digital I/O, certain I/O lines can function as analog inputs, digital counters, and pulse width modulation (PWM) outputs. One of the powerful and useful features of the ETH32 is its event monitoring capabilities. In a nutshell, event monitoring allows the ETH32 to monitor different input signals and send a notification to your application when that signal has changed or met your criteria. Since the monitoring is constantly performed directly by the ETH32, it provides a much better alternative to polling over the ethernet connection. It provides faster response, is very efficient with network traffic and CPU resources, and is typically much easier to implement in your application. Event monitoring capabilities are included for digital I/O ports, analog channels, and digital counters. A number of convenient product accessories are available for the ETH32. Devices with firmware v3.000 and above (now shipping) support DHCP. Devices with firmware v3.000 and above also now provide 256 bytes of user-accessible EEPROM memory storage (non-volatile - maintained through power loss). Two of the I/O lines can be configured as digital counters, one 16-bit and one 8-bit. Hardware Events are also supported on the counters. A counter can be configured so that an event fires when the counter reaches a specified value. Two of the I/O lines can be configured as PWM outputs. Several product accessories are available. Comes with software libraries for Windows (supports XP, Vista, Windows 7, 8, 10) and Linux, making it very simple to use the device. Includes support for Microsoft .NET languages (C#, VB.NET, etc), C / C++, and Visual Basic 5/6. A user-contributed REALbasic library is also available. The protocol used over the TCP/IP socket is documented for those who want to do the network programming themselves or are using an unsupported platform. Comes with a configuration application that allows the device's IP address, subnet mask, and gateway to be configured, or DHCP to be enabled or disabled over the network connection. This uses UDP broadcast packets to detect all ETH32 devices on the local subnet and configure the selected device. By using UDP broadcast packets, a device can be configured even if its current IP address does not match the local subnet. See the Product Revision Log for a history of product changes. Complete documentation, software, examples, and source code are available for download from the ETH32 Downloads Page. Conformal coating of the PCB for harsh operating environments. Unusual I/O pin or auxiliary power current requirements. Operating temperature outside the given specifications. 06/20/2011 Rev. B Modified Analog VCC (AVCC) power supply circuit to improve power supply stability during Port 3 I/O transients. 03/23/2016 (software) Software-only update: Distribution v2.03 released, which includes API v2.01, fixing a bug where old reponse data could get passed to the PC software application in certain scenarios.